Our supplier partners provide an unsurpassed reputation of technical quality and engineering experience in the food Industry. A few of the products offered to the Food Industry are Conveyor Belting, Conveyor Components, Flat Top Chain, UHMWPE (Polystone) Conveyor Curves and PTFE Coated Glass Cloth Belting (Tygaflor). Specialty products include FDA approved Conveyor Belting, Flat Top Chain, FDA approved plastics for commercial cutting boards, boning boards, specialist plastic guarding solutions such as Makrolon Polycarbonate UV Sheets and specialist film packaging products. Dotmar specialises in the replacement of OEM (Original Equipment Manufacturer) parts for the Food Industry and can reverse engineer these plastic parts in accordance to your specific requirements. Food Processing and deboning and preparation facilities in meat, fish and poultry plants have a constant use for effective and easy to maintain working surfaces. Polystone P500 HMWPE lends itself well to this environment and is the ideal food processing work surface. Deboning boards and preparation facilities in meat, fish and poultry plants have a constant use for effective and easy to maintain working surfaces. Polystone lends itself well to this environment and is the ideal processing benchtop and cutting board. 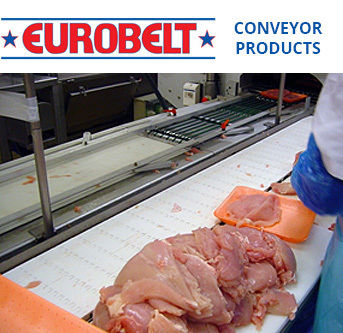 Eurobelt and System Plast conveyor belts are equipped to handle sub zero temperatures for chiller room conveying solutions. Dotmar has a comprehensive belt building facility in Victoria that offers a fast turnaround on conveyor belt builds to accommodate this fast moving industry. System Plast NG Flat Top Chain offers a dry run capability that was though not available. In areas where Stainless Flat Top Chain was running lubricated, NG flat top chain proved to be the best dry alternative. 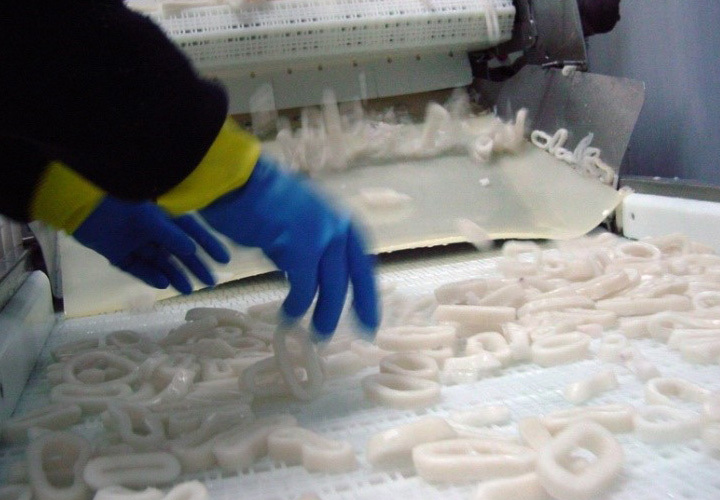 System Plast NG chain also offers decrease conveyor noise over acetal based resin as found in other flat top chains. 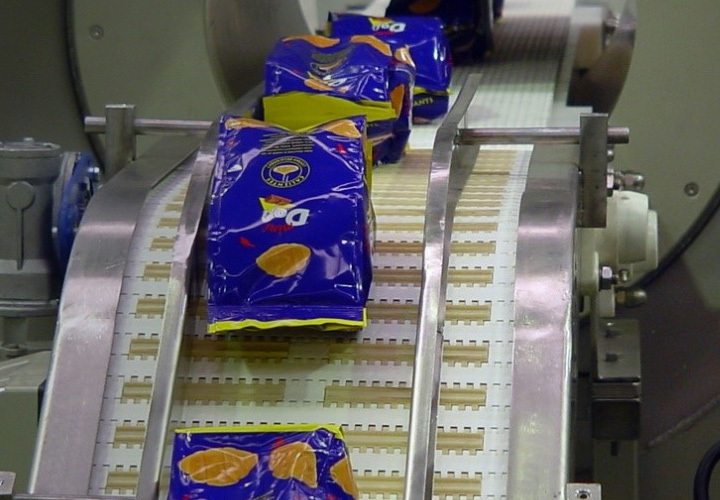 Dotmar offers a broad range of conveyor plastic products for wet processing in the Food Industry. Pasteurising, Rinses, Dewatering are no match for engineering plastics such as Polystone UHMWPE, Polystone Wear Strips, Eurobelt Conveyor Belts and Slat chain. 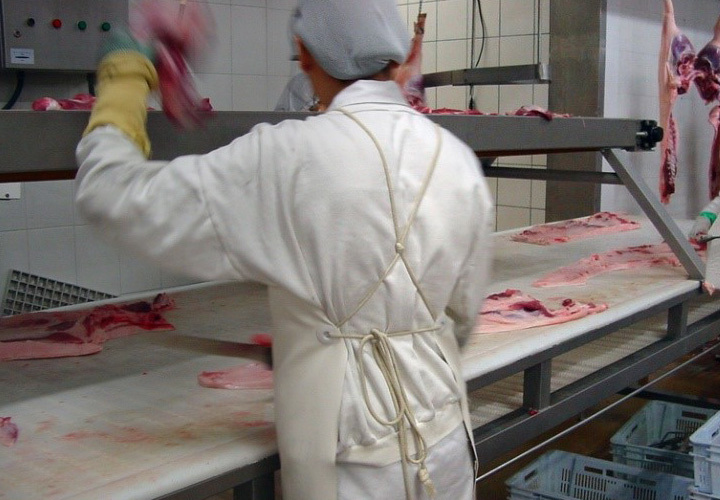 One of the greatest concerns in meat industry is the cleaning of the production lines. Blood, viscera, and other organic substances make cleaning the belts difficult and, therefore, obtaining optimum sanitary conditions. That is why in food industry, and particularly in meat industry, all conveying systems have to be entirely accessible in order to carry out effective cleaning. The EUROBELT plastic modular belts can be moved, taken off, lifted, even easily dismantled, to allow the access to the most difficult areas to be cleaned. 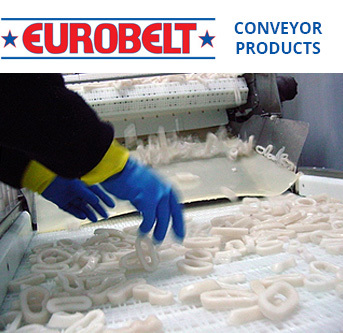 Some belts have been specially designed for carrying out continuous cleaning without stopping the production line. Some years ago the plastic modular belts brought about a technical revolution in the seafood industry. The conventional conveyor belts were frequently replaced due to tears caused by stones conveyed with the fish, or by the cutting tools used by processors. Every boat required a storage room to keep spare belts for every production line, as they could not be repaired in such a humid environment. On the other hand, just one box with some spare parts is enough for repairing the plastic modular belts of every conveyor. On land, the plastic modular belts will work in cool rooms, without absorbing any water, flavour, or smell, solving adherence problems of the frozen product on the belt. Likewise our C12 belt allows the conveyance of fish fillets without deforming them. 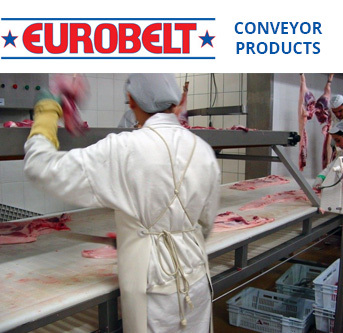 The EUROBELT plastic modular belts enable conveying of meat directly on the belt, as well as in trays or plastic containers, with the sanitary guarantee provided by the easy cleaning of our belts. There is no problem in working at low temperatures, so that the product can be frozen directly on our belts, which have the advantages of lightness, flexibility, and frost easy removal. Our belts do not smell or any bacterial contamination after proper washing, as they are manufactured from plastics with minimal absorption.